i have been struggling all week long to get stuff done, so to happy its friday means to be happy that i get to work and do projects all weekend long. lol. i admit it. i have a lot of goals tucked away in my head. some of them are a lot less realistic than other, but i still hold on to them. owning a men's retail shop is a goal of mine. think the aesthetics of a billy reid with the inventory of a sid mashburn. if i did this one would be part of my shop. it was $30 i think. i'd paint it a lacquered black or red, perhaps a grey white wash. id store all kinds of amazing shirts and sweaters in it. alas, i dont have that shop so it stay right where it was. honestly, i was surprised to see something like this in this particular store. 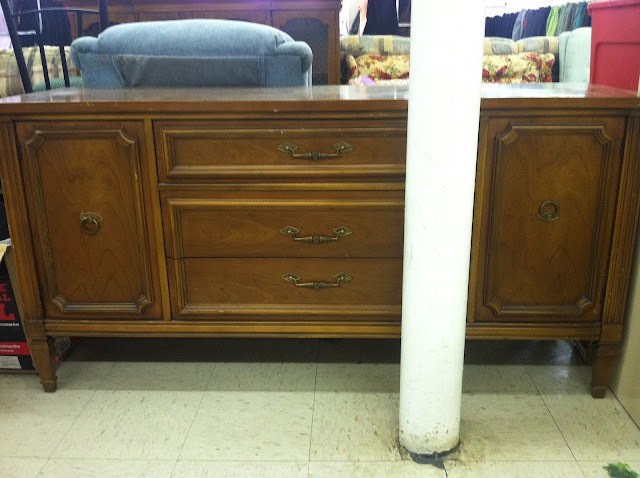 its been a long time since i have come across a quality classic wooden piece of furniture that wasn't overpriced. i hope this store gets the hint and does better with their pricing. if i remember correctly it was $29.99. imagine these painted white with a nice graphic print. uh huh. you see what I did there? i gave you inspiration. lol. grated the grey black isnt so bad either. well that is it for me this week. not much, but it is something. you can tweet me with #FridayFinds on twitter (MrGWHunting) if you'd like to share anything. i will trying to share a few on facebook as well as twitter.